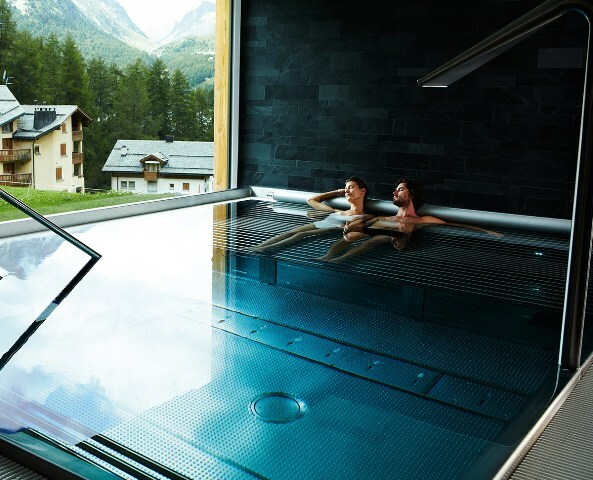 If the glam and glitz of St. Moritz brings on a weary sigh as the thought of another round of dressing to impress is simply too much to bear, then salvation awaits at Nira Alpina Hotel in Silvaplana. 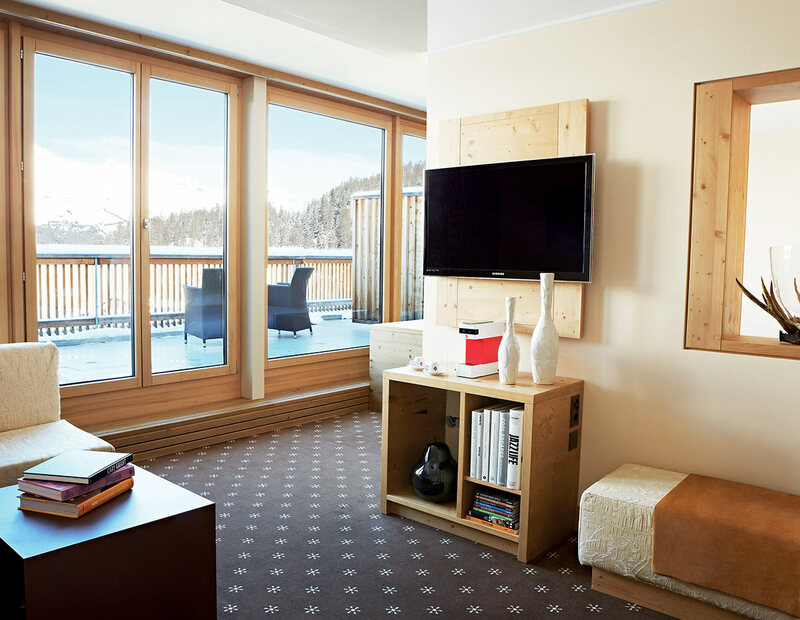 Perched right at the entrance to the Corvatch cable car, the highest station in the Engadine region, Nira Alpina Hotel is a rustic luxury retreat where alternative and quirky replaces formal and fussy. Where passion and personality replaces scorn and snooty. It is, dare I say it, bordering on bohemian, but anyone with a sense of fun will love it. 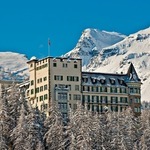 The Nira Alpina Hotel is a mere 10 minutes from St. Moritz, but light years away in preference as far as I am concerned. It’s like being in a Nira cocoon attached way above Lake Silvaplana with just the mountain and the views for company. 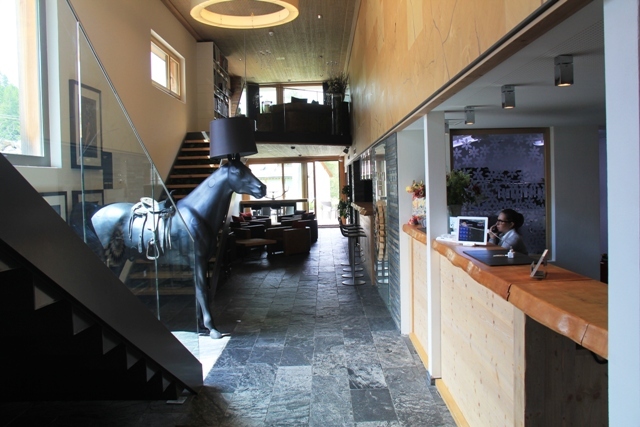 I could tell this was going to be an alternative experience by the full size antique sleigh and collection of miniature cows adorning the lobby, not to mention a rather large saddled blue art horse. That said, there was nothing quirky about my room; a huge pine panelled space with a queen bed, enormous glass windows leading out to a lovely spacious terrace overlooking the lake and mountains and a comfy sized bathroom with his and hers sinks. 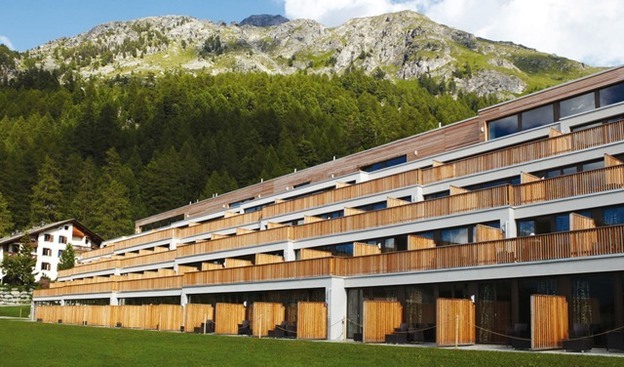 The Nira Alpina Hotel makes full use of its exclusive position, with a private walkway directly into the cable car station and, in winter, as you plummet down the home stretch, you can glide straight in to the hotel’s bistro. Better still, if you have kids, you can sit and sip coffee or hot chocolate and watch the nursery slope action from the terrace. All this of course was a small distraction for me, as it was the height of summer and I was more interested in following the smell emanating from the hotel’s bakery; a wondrous place of fresh breads, pastries and cakes. 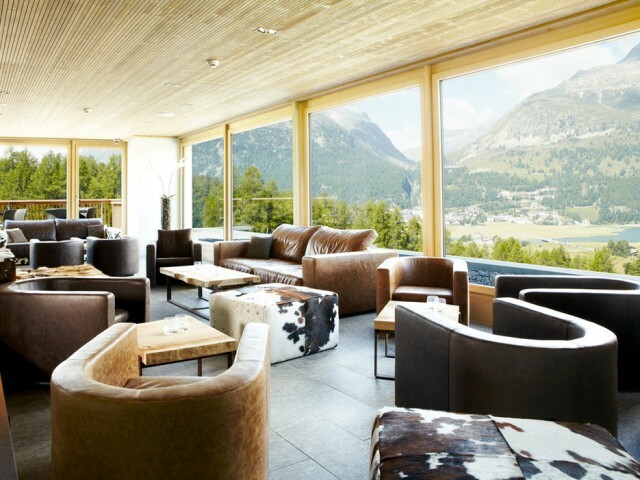 After a day walking the Engadine slopes and breathing the scented pine forests the roof top beckoned; a cool cocktail bar with lots of quiet corners and chilling music and the Stars restaurant, the domain of Executive chef Florian and Restaurant Manager Katja. Tearing myself away from the heavenly views for a second to concentrate on the food, a creamy fennel soup with lemongrass and coconut milk was a highlight together with a succulent pork rack with pumpkin, pumpkin seeds and caramelised apples. 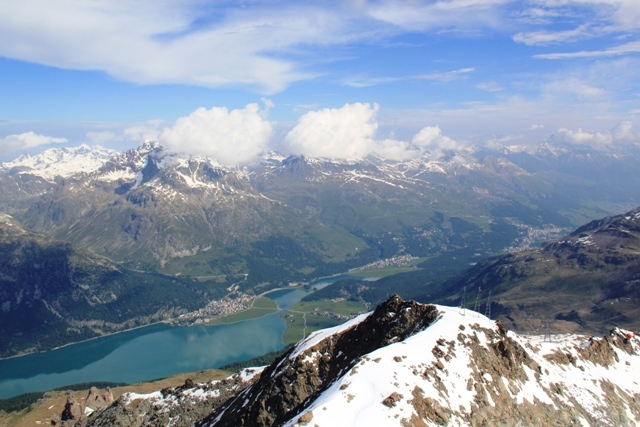 St Moritz was glistening far below off to the right and I couldn’t help wondering if the folk down there were enjoying themselves quite as much as I was. The rather tasty glass of local red in my hand did nothing to cloud my judgement of course. The next morning, after a breakfast laden with the fresh delights of the bakery amongst many other things, I was under the very skilful but sturdy hands of massage therapist Anna Marie who in the space of 90 minutes, succeeded in expertly rejuvenating my limbs and balancing my ying and yang in preparation for my continued drive along Switzerland’s Grand Tour. The Spa by Pure Altitude is an altogether less rustic experience with state of art whirlpool, underwater relaxation bed, steam and sauna and waterfall showers. For me, summer in alpine Switzerland is an entirely different feel from winter. The cows are out enjoying the mountain pastures, there are bursts of colour from flowers everywhere and the lakes have that fabulous blue sheen to them. 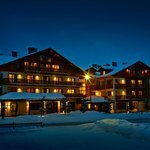 But in winter, I can sense how the Nira Alpina Hotel could offer such an alternative draw for skiers who genuinely want quick access to the slopes as well some luxury to return home to. The hotel’s Italian restaurant only opens in winter which is a good enough reason to come skiing anyway. 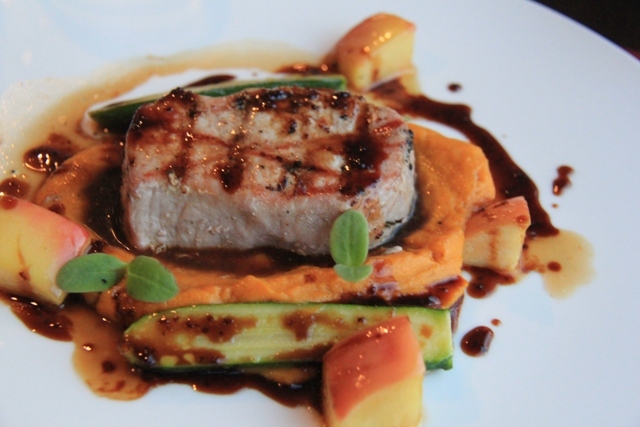 But it is exclusively run by Italian chefs specially flown in for the ski season. Let loose your inner nomad and detour around St. Moritz to Silvaplana, where the Nira Alpina Hotel might just be the salvation your seeking.